A pioneer in education, Brooklyn Children’s Museum was the first museum created expressly for children when it was founded in 1899. Its success has sparked the creation of 300 children’s museums around the world. With award-winning, hands-on exhibits and innovative use of its collections, the Museum engages children from pre-school to high school in learning adventures. It is the only children’s museum in New York City, and one of few in the country, to be accredited by the American Association of Museums. Brooklyn Children’s Museum enriches children’s lives through inspiring, involving, and challenging them to learn about themselves, others, and the world around them. The Museum is a leader among cultural institutions, recognized for innovation in addressing the educational, cultural, and social concerns of youth and families in our diverse and dynamic urban environment. Brooklyn Children’s Museum was founded in Crown Heights, Brooklyn, over a century ago, and has been proud to call that community its home ever since. As the neighborhood has changed and grown, so has the Museum—embracing the rich diversity of its surroundings. Brooklyn Children’s Museum has an ongoing commitment to presenting programs, exhibits, and performances that welcome everyone and build understanding of the diverse cultures in New York City and around the world. 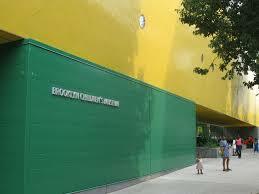 Brooklyn Children’s Museum has just completed an amazing, eco-friendly expansion project! The Museum is now equipped to provide 21st-century learning adventures for growing numbers of children from the neighborhoods of New York City, the greater metropolitan region, and beyond. The Museum has doubled in size and incorporates the latest innovations in high performance architecture. It is the first “green” museum in New York City, awarded a LEED-Silver certification by the U.S. Green Buildings Council. HOW CAN A YELLOW BUILDING BE GREEN? The outside of the Museum’s new building is daffodil-yellow, but its inner workings are “green.” In keeping with the Museum’s commitment to preserve and protect the world’s natural resources, it uses environmentally advanced, sustainable, renewable and/or recyclable materials and systems in the building’s design and construction. Brooklyn Children’s Museum is one of the few children’s museums in the world with a permanent collection, including nearly 30,000 cultural objects and natural-history specimens. The cultural collection contains both ancient and present-day objects, including musical instruments, sculpture, masks, body adornments, and dolls, as well as everyday household and personal items. The natural-history collection contains rocks, minerals, and fossils, as well as mounted birds, mammals, insects, and skeletons (highlights include the complete skeleton of an Asian elephant, dinosaur footprints, and a whale rib). For years, much of the collection has been inaccessible to the public simply because of space limitations. Now, an expanded collection study area allows the Museum to display more of the collection and to offer more hands-on activities—so children learn by touching as well as by looking. Brooklyn Children’s Museum is a founding member of Heart of Brooklyn, a unique partnership among six of Brooklyn’s most treasured cultural institutions: Brooklyn Botanic Garden, Brooklyn Children’s Museum, Brooklyn Museum, Brooklyn Public Library, Prospect Park, and Prospect Park Zoo. To utilize their collective resources and better serve a diverse and multi-cultural community as well as the greater public, these organizations formed Heart of Brooklyn as a non-profit organization in July 2001. Heart of Brooklyn provides a forum for collaboration to achieve a shared vision of increased access to and awareness of our vast educational and cultural resources. Take the 3 train to Kingston Avenue. Cross Eastern Parkway and walk six blocks on Kingston Avenue, following the flow of traffic. Turn left on St. Marks Avenue. Walk one block to the corner of Brooklyn Avenue. Take the A train to Nostrand Avenue. Following the flow of traffic, walk south six blocks on Nostrand Avenue to St. Marks Avenue. Turn left on St. Marks Avenue. Walk two blocks to Brooklyn Avenue. Take the C train to Kingston/Throop Avenue. Walk six blocks on Kingston Avenue, against the flow of traffic. Turn right on St. Marks Avenue. Walk one block to the corner of Brooklyn Avenue. Take the B43 or B44 to St. Mark's Avenue, or take the B25, B45, B65 to Brooklyn Avenue. The Museum is on the corner of Brooklyn Avenue and St. Marks Avenue in Brooklyn, New York. The Museum currently does not have a parking lot, but street parking is usually easy to find.